I am guilty of speaking badly of the new congresswoman from New York. She is obviously the product of failing educational systems unable to do anything but pump her full of fatuous self-esteem. I’d lay odds she has a large box of participation trophies in her parents’ basement. Though it is fun to bash such a bashable subject, I write to thank her. She has made things clear; things that have been vague and foggy are now utterly transparent. Many let slide Obama’s fuzzy promise to “fundamentally change” America. It was a little hazy – he never elaborated on it and the media never asked him to. But AOC has laid it out – very briefly; I understand that her ‘Green New Deal” has been scrubbed from her site and it’s easy to see why. She’s let the cat out of the Democrat bag. She and Sen. Edward Markey opened Pandora’s box this week and 70 prominent Democrats immediately signed on including many of the recent presidential hopefuls. This woman is not a lone nut case, though she may be the only Democrat who actually believes this nonsense can be done. What crawled out of Pandora’s box? Everything destructive. This young woman wants to shut down American energy – nuclear included. She seems not to worry about how we’ll heat our homes or cook our food or travel from one place to another. She’s utterly unaware that it takes a great deal of energy to grow crops, manufacture goods, and build houses. She plans on – within 10 years – getting rid of 99% of the gasoline-powered cars in this country. She wants to stop of air travel and substitute high-speed rail – which we don’t have, which has proved a disastrous waste of money in California, and which will make it tricky to cross oceans. She wants the government to provide everyone, whether they work or not, with a guaranteed income, good housing, medical care, free education, and a vegan diet – the latter to cure the problem of cow flatulence, which, if not stopped, will destroy the planet. That clears that up – it’s only government money, which we all know just grows on printing presses and computer hard drives. Venezuela’s 80,000% inflation rate doesn’t strike her as a cautionary tale and evidently her econ degree didn’t require a course in inflation and its causes and effects. But I thank her. Her timing was impeccable. The country – at least 72% of it –had enjoyed President Trump’s triumphant State of the Union address earlier in the week. That speech resurrected the pride in being an American. He talked about liberating Jewish Holocaust victims, about storming the beaches of Normandy, about curing childhood cancers, about protecting our southern borders. He reminded us of how prosperous the country has become in just two short years, and better yet, he helped us look ahead at the possibilities appearing on our national horizon. He talked about space exploration, innovations and inventions, medical breakthroughs, and soaring prosperity. The speech was heart-warming, encouraging, hopeful, and it stirred again our pride in being a hard-working, imaginative, courageous people. It even opened the door for cooperation in Congress, making it seem like it just might be possible. Enter AOC and her tribe of dreary henchmen. According to these “Justice Democrats” (justice??? ), the world will end in 12 years if we don’t plug the cows and quit breathing. That’s a cheery and inspiring vista. In her future America, we will all be some kind of government drones and will spend our days stumbling around town scrounging for food and waiting in lines for our government handouts. We won’t be able to go anywhere, or buy anything because nothing will be available to buy. We won’t be able to invent anything, make anything, or fix anything unless we can do so ex nihilo. We will be cold, bored, and utterly trapped. The government will control what we eat, what we do, what we learn. Besides the terrifying future this lays out, nothing on AOC’s list of must-dos is even remotely possible. Rebuilding just the private homes in this country would have to be done at a pace of at the very least 120,000 houses a week for 10 non-stop years. And it would have to be done sans cars and trucks and oil and natural gas and any of the products produced using those items and commodities. And if the government is going to provide you with a living whether you want to work or not, who’s going to do the manual labor? In fact, the whole labor thing is very unclear in this plan. If you are getting a guaranteed income and you’ll be penalized with a 70% tax if you do something that is really successful, why lift a finger? I have no idea who will be willing to do all this work. Doctors already hate what Obamacare has done to the medical profession – what will they do when faced with full-on socialized medicine? And just how does she think people and goods will get around? I suspect she has little understanding of the vast regions of nearly uninhabited land one has to travel to cross this country; it’s not all Brooklyn. Those of us who have crossed the Rockies and the deserts of this great land know that high-speed rails won’t cut it even if they could be built. Neither will electric cars; I can’t imagine plug-in stations dotting the barren highways in eastern Oregon. On the other hand, Trump wants to see everyone working, inventing, producing, enjoying and employing all the gifts God has bestowed on us. He wants us to treat every person with the love and respect due someone created in the image of God. He wants this for all American citizens regardless of race or ethnicity, of age, of religion, whether we’ve been born yet or not. Isn’t that what all Americans want? Isn’t that what decent people want? We want freedom – Americans have always wanted, fought, and died for freedom. 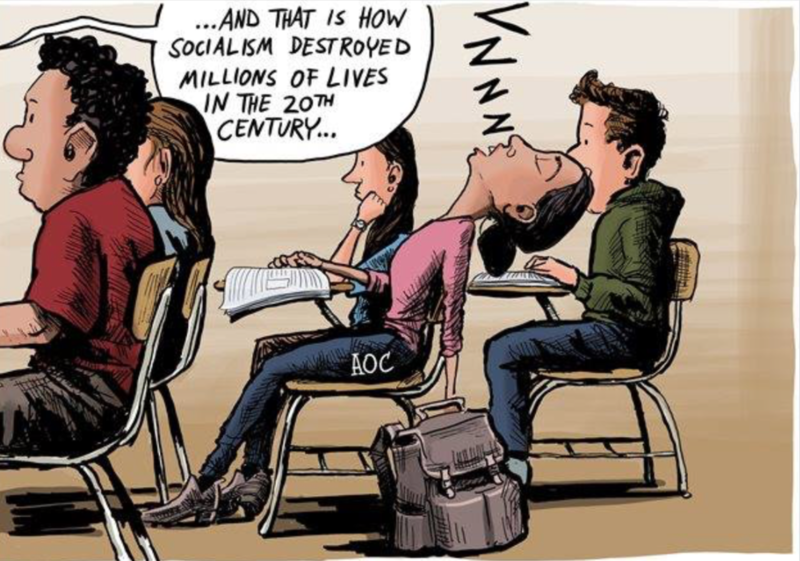 AOC’s nightmare doesn’t allow for that. For one thing, it takes a certain level of prosperity before freedom means much. AOC’s vision is being played out in Venezuela; it’s not freedom when you have to eat the family dog. It’s not freedom when you can’t go where you want to go and get there the way you want to get there. It’s not freedom when you can’t build what you want to build, imagine what you want to create, or take care of your family how and where you want. AOC just laid it out for us and I’m grateful. Now it’s abundantly clear. We can choose misery, hunger, and hopelessness or we can pull on our grown up work boots and make this country greater than we’ve ever thought possible. We can allow ourselves to be regulated into oblivion, or live up to our potential and in the process help everyone else to do so, too. We can be cowed into submission by an elaborate lie, proven false over and over, or we can recognize that God made this planet for us to live on, to enjoy, to use and develop. We can become the kind of craven, listless do-nothings that will sell their souls for a mess of pottage, willing to believe lies and nonsense – or we can roll up our sleeves, thank Almighty God that we are Americans and start building a glorious future.